Also recently reopened, the Matterhorn Bobsleds, now with FastPass! 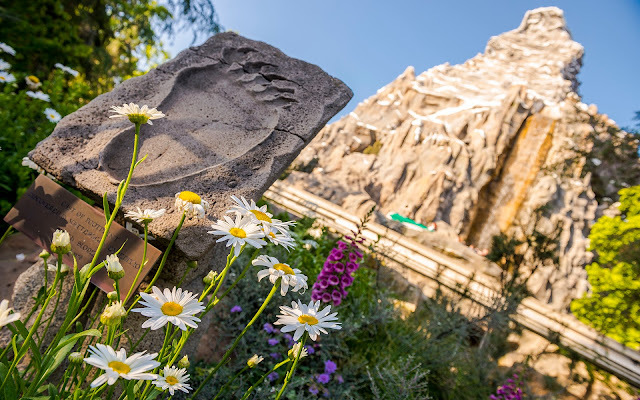 This classic roller coaster is among the oldest steel roller coasters in the world, and its journey into the Swiss Alps gives riders a harrowing encounter with the abominable snowman inside multiple times. But you wouldn't guess it from the idyllic scenes outside--the pretty alpine snow, the cascading waterfalls, the colorful wildflowers. No, you wouldn't guess that a beast lurks in side--unless you notice the clues. Evidence of an abominable snowman can be found around the Matterhorn, if you look hard enough.